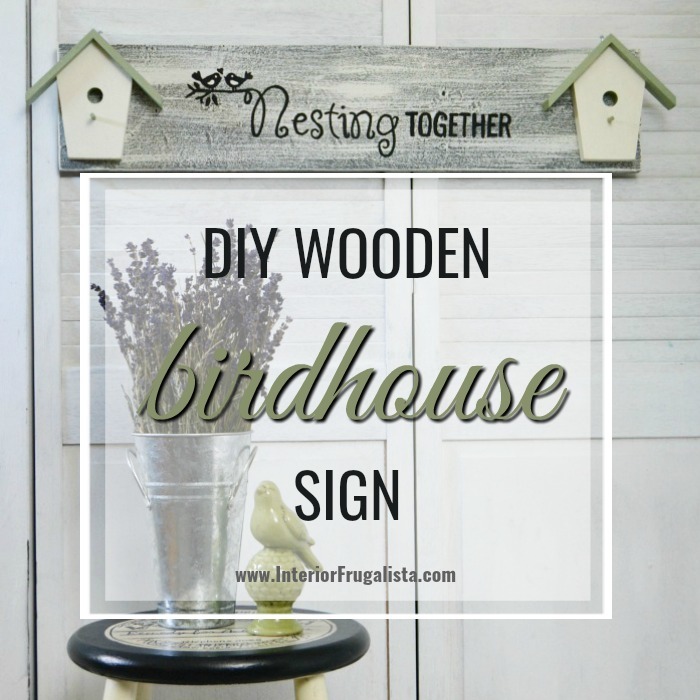 With the arrival of my favorite season soon, today I'm sharing an adorable Summer DIY Wooden Birdhouse Sign using a salvaged board and two wooden birdhouses for under $4. It would make such a cute wedding or anniversary gift! 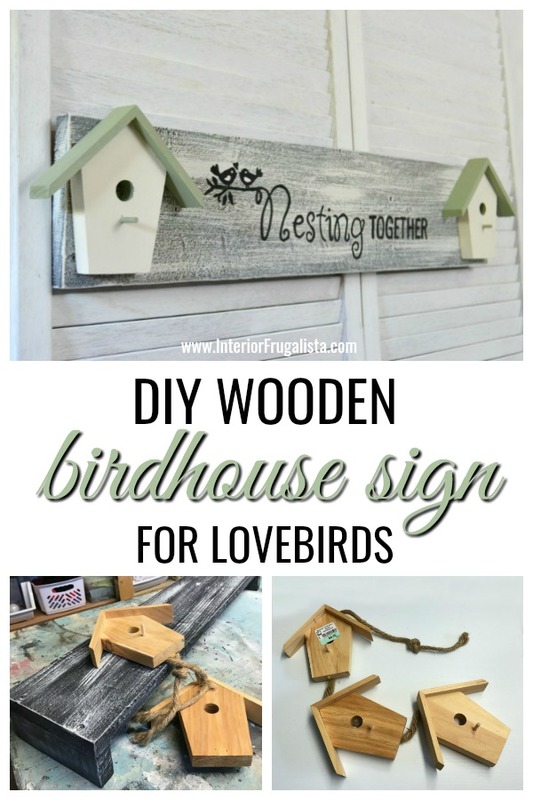 I plan on hanging this lovebird sign above a garden bench for two on our deck. This sign launches my Summer Deck Makeover series. For three weeks we've been working tirelessly on a budget-friendly deck makeover, one DIY project at a time. Our goal is to create a cozy and inviting conversation area on a tight budget. 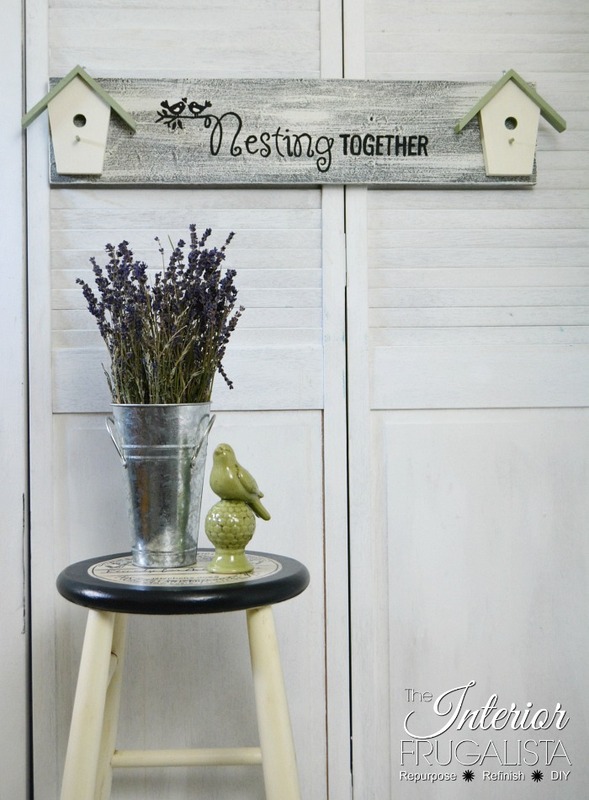 It all started with this wooden birdhouse hanger from Goodwill. The board for the sign is from a shelf that I'm no longer using that I made a few years ago from a salvaged shutter. The third birdhouse from the hanger was used in my Welcoming Summer Birdhouse Wreath. To lighten the dark board used for the sign I simply dry brushed two layers of old white chalk paint in long random strokes with a chip brush. 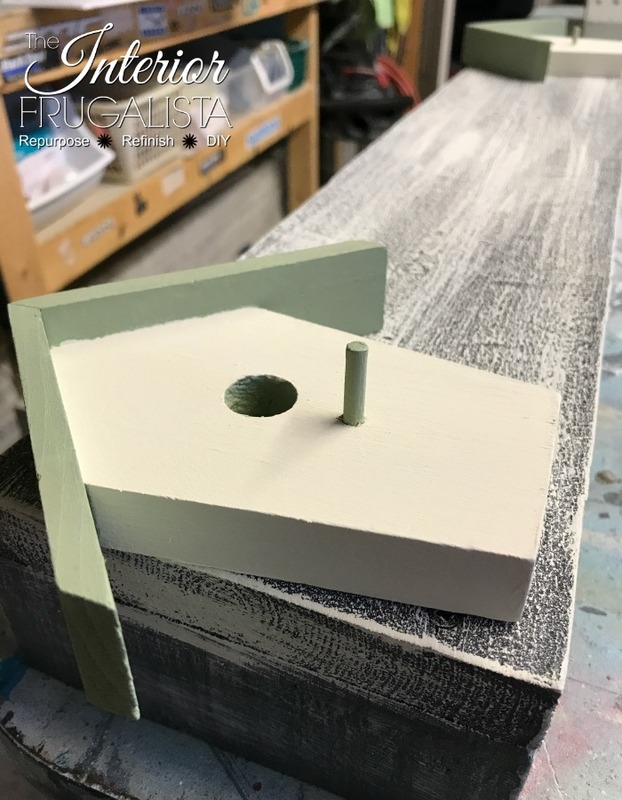 The birdhouses were chalk painted in the colors old white and sage green. With my favorite wood glue and a couple of small clamps, I attached the birdhouses to each end of the sign. I lined them up to 1-inch from the bottom, widest part flush with the sides and the roof peeks overhanging at the top. Then I called it a day to let the glue cure overnight. ...and then came down in the morning to realize my big oops. Notice in the photo above that the sides are still attached to the salvaged shelf? That's when Mr. Frugalista came to the rescue. 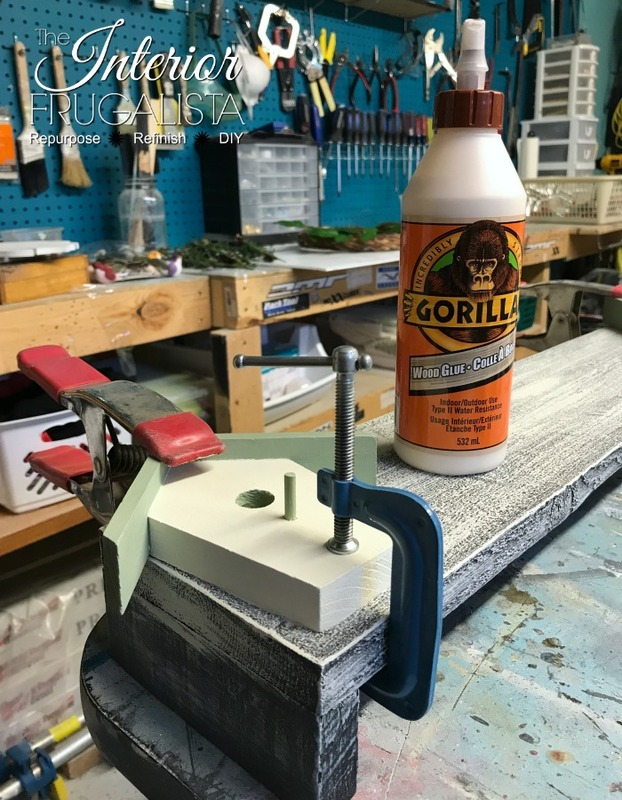 He put the shelf riser into a vice to hold in place and gently worked the board up and down to loosen the joint. With a small pry bar, he separated the joint enough to cut the screws off with a Dremel tool and metal cutting disc. Could have saved him a lot of work had my brain not been on a coffee break when I attached those birdhouses! Next, I created a cute graphic in Picmonkey and enlarged it to fit across the board in Blockposters.com. To learn how to transfer graphics onto wood, visit my Graphite Image Transfer Technique tutorial. Once the graphic was transferred onto the wood I simply traced over it with a black fine point permanent marker. You're welcome to use my unwatermarked graphic by pressing the link below. 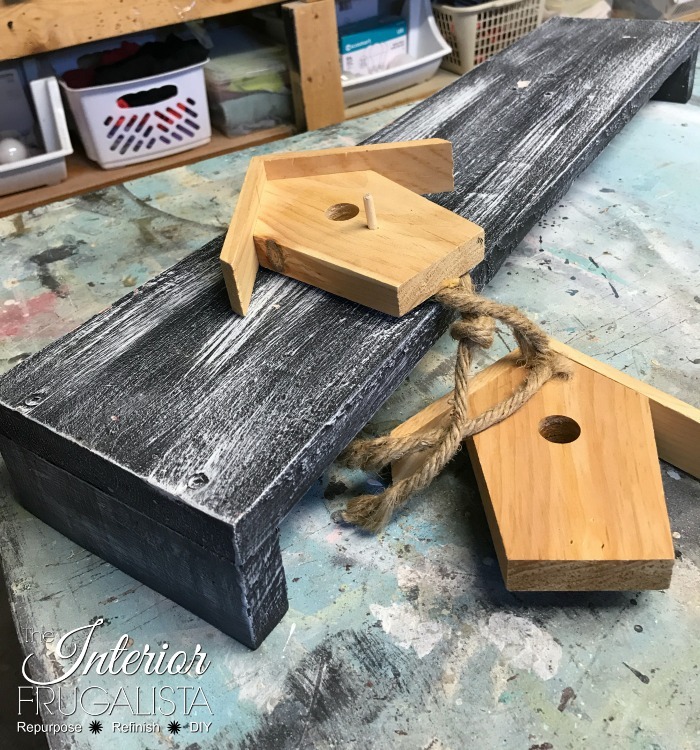 The sign, including the birdhouses, were protected with two coats of a Varathane Outdoor matte clear coat applied with a small foam brush. Items on the list that don't include a link can be found at The Interior Frugalista SHOP on Amazon. Attach two D-ring or triangle picture hangers onto the back of the sign (sorry I forgot to take photos of this step) the same distance on each side from the top of the sign. If you don't want the hooks exposed, set the top of the hook just below the edge of the sign. Handy Tip for hanging signs with double hooks - no measuring tape required! Run a piece of masking tape across the back of the sign, laying it over the D-hooks and keeping the tape straight. Mark the very top of each D-hook with a pen. Remove the masking tape and place it on the wall where you plan to hang the sign. Use a level to ensure the tape is straight. Hammer the nails on the pencil dots. Remove the tape and you're ready to hang the sign. 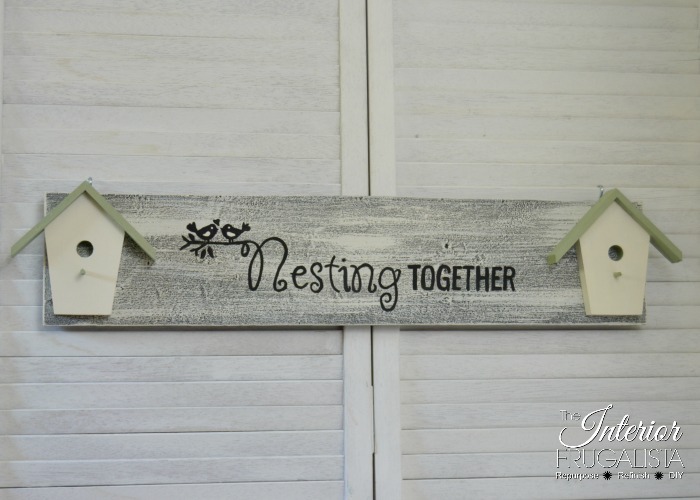 That's it, a cute DIY Birdhouse Sign - perfect for a wedding or anniversary gift for the lovebirds in your life. Also a super cute sign to hang behind a garden bench for two - coming soon. I'll be sharing Project Two - A Budget-Friendly Deck Restore, of our Summer deck makeover series next week, so be on the lookout for that. 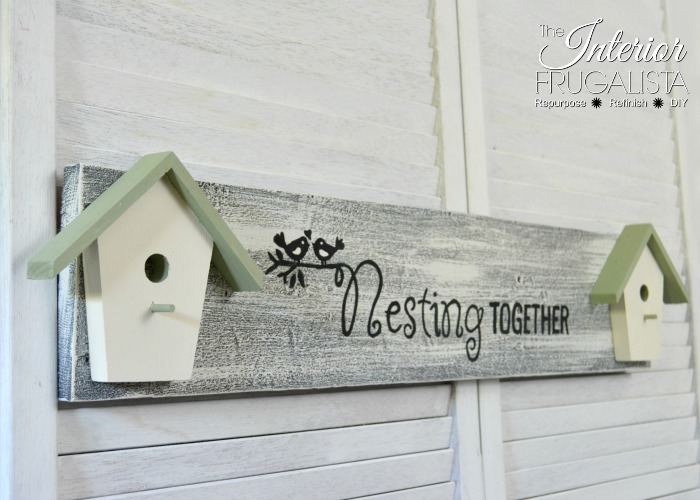 Loved your birdhouse wreath yesterday and loving your "Nesting" sign today. 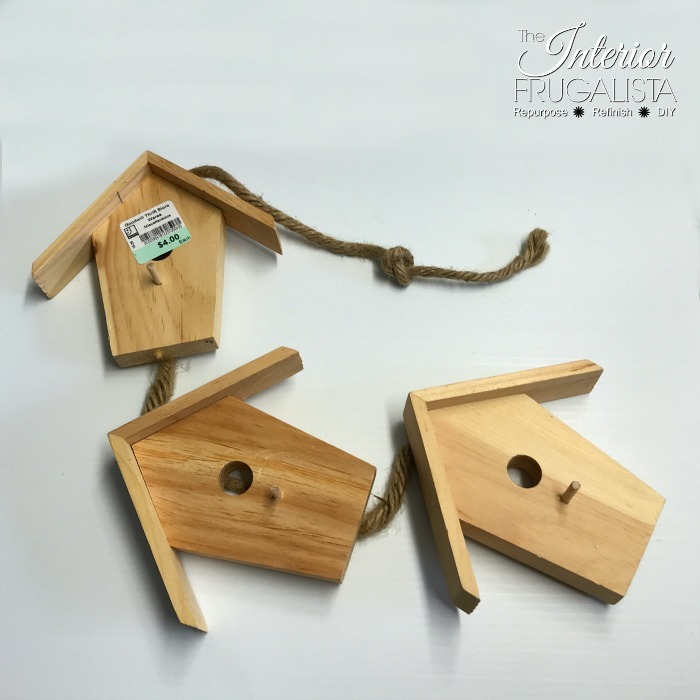 You got your money's worth out of those 3 birdhouses! Love your creativity. Thank you so much, Barb! 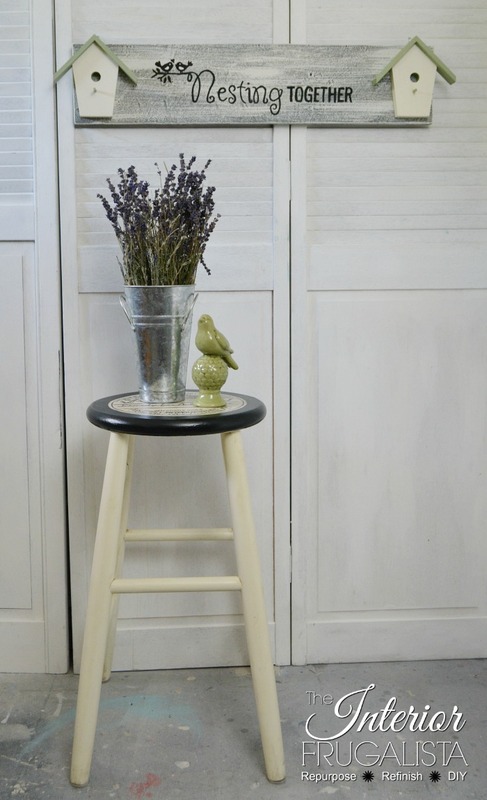 Yes, that thrift store birdhouse hanger was a sweet find.